Spinach and Apple Salad is the ultimate side dish on our table in Fall! No matter what the main course is, we love to have this apple salad full of crispiness. When you have already started simmering slow-cooker dishes or spicy stews, the best side dish to match with them is a crispy green salad. As the nature gives us its best spinach and apple in this season, why not combine these together in a large salad bowl? 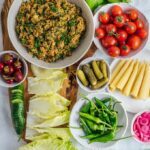 Green salad is mostly associated with lettuce and spinach is not considered as a typical salad ingredient in Turkish cuisine. As we are always open to new combinations, we tried this spinach and apple salad once and we’ve been pairing it with almost anyhting we cook since then! We don’t celebrate it here, but I know many GiveRecipe readers will be cooking for Thanksgiving very soon! If you’ve decided on the main dish and looking for a fresh side dish to pair with your traditional Thanksgiving meal, give this extremely fresh and light spinach and apple salad a try! Besides spinach and apple, I used radishes to make it even crispier! And I love decorating dishes with pomegranate seeds these days. Don’t you think they make everything more attractive and appetizing? These jewelry like seeds are not only for the look, but they also give an amazing feeling of a freshness explosion when you are eating them in this apple salad. Don’t you think a good quality feta would be a nice touch among all these crunchy foods? Depending on the amount of cheese you use in it, this spinach and apple salad could even be served as a light lunch. Add a generous amount of feta if you are planning to have it as a vegetarian lunch. As for dressing, you don’t need many ingredients and I recommend not to go heavy. 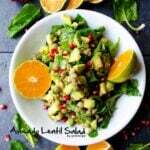 You need just 3 ingredients to make this spinach and apple salad light and tangy: Homemade pomegranate molasses, lemon juice and extra virgin olive oil. Mouthwatering, right? A light, fresh and cruncy side dish to pair with any holiday meal! Toss all salad ingredients except feta. Mix ingredients for dressing well and pour it over salad.